Nazareth Hagop Berberian was born on June 11, 1951, in Yerevan, Armenia. His father Hagop had fled the 1915 Armenian Genocide from the village of Belan, Turkey, and had found refuge in Aleppo, Syria, where in 1943 he married Mary Kilejian, another Genocide survivor from Aintab, Turkey. Determined to return to their homeland, they joined the great wave of repatriation and made Yerevan their new home in 1946. Nazareth was the younger of the two surviving children. His other two siblings had died earlier. Nazareth was only five years old when the Berberians lost another family member, their father Hagop. That loss was a heavy blow to the poor immigrant family. Twenty five years into their residence in Yerevan, when an opportunity finally arose to emigrate from the USSR, the Berberians relocated once again to find better refuge outside Soviet Armenia. In 1971, the family made their way to the U.S.A.
Nazareth was 19 years old when he had to adjust to a completely different environment. Being a lively and positive person, he quickly made many friends and partners. His outstanding gift of entrepreneurship was his initial capital in his quest for triumphs in the world of business. Intelligent and highly skilled, Nazareth became a successful carpet and real estate businessman in the United States. What is unique about his success story is that he was in the category of rare businessmen whose kindness and generosity do not hinder their skyrocketing ascent in their professional career. While in the U.S., he never severed his tight bonds with Armenia, which served as his energizing "battery." His passports were filled with visa stamps that flew him to Soviet Armenia and back ever so often. But it was the collapse of the Soviet Union that not only increased the frequency of his visits but also dramatically altered the intention and duration of his sojourns. Once an opulent, prospering republic during the Soviet era, Armenia of the early 1990s had become a war-torn, newly independent state with a paralyzed infrastructure and shattered economy. The chronically corrupt, mafia-driven government had plunged the majority of its population below the poverty line, as defined by the United Nations. The war, economic calamity and humanitarian disaster eventually caused mass emigration that stripped the country of one-third of its population of three and a half million. According to various estimates, a total of approximately one million people fled the country throughout the 1990s. This was the Armenia that Nazareth Berberian had to witness during his visits following the fall of the Soviet Union. He took it as a challenge and decided to help alleviate the impoverished condition of his people. His first attempts of lending a hand amounted to simply giving money to people who were suffering the most. Due to the paralysis of the social infrastructure, there was no reliable mechanism that could accurately reflect people's most current living standards. Therefore, Nazareth initially had to locate and support the target group himself with the help of a classmate, former business partner and former Education Minister, Areg Grigorian. Later on, St. Sarkis Church in Yerevan was chosen as a place for registration of potential beneficiaries. Among them were homeless refugees from Artsakh, 1988 earthquake survivors, wounded soldiers in need of surgeries, starving children orphaned by the war, families of fallen liberators, and others. Nazareth's guiding principle throughout his life was the following: "If your one hand is doing charity, your other hand should be unaware." He was always against media coverage of his charitable activities. "Nazareth Berberian's charity has been publicized only once, when all large Armenian families received aid in 1993," remembers Areg Grigorian in an interview to Ankakh weekly, "And I'm not talking about the habitual beans or sunflower oil everyone was fed up with. People had received so much food that they couldn't carry. The Ministry of Social Security has sent numerous letters of gratitude to Berberian." Surprisingly, many of the beneficiaries until this day are unaware of the source of their support. Zemfira Arshakian, a widow with one kidney, remembered registering in the list of needy people at St. Sarkis Church one day in 1993. She received 4,000 rubles to look after her two children, however, she wasn't told the name of the benefactor. "I wore out the path to the church for a whole year, trying to learn his name. Eventually, my efforts were rewarded. It was Berberian." To a large extent, it is thanks to Areg Grigorian that we know something about Nazareth Berberian’s early period of benevolence. Fortunately, he meticulously documented Nazareth's otherwise anonymous acts of charity and maintained the records for future generations as a good example of not only patriotism but philanthropy in general. Over the years, Nazareth Berberian's humanitarian relief increased in scale and geographic diversity. “In April of 1999, I went to a remote village 35 kilometers off the main road in Northern Kashatagh to photograph a family that had 15 children,” remembers American-born Armenian, Ara Manoogian, a friend of Nazareth Berberian’s who lived in Artsakh at the time. “What I found was starving children and parents in despair. That night I visited Nazareth at his home in Yerevan and shared with him my findings. At best I was expecting his sympathy and sorrow for these villagers but instead was invited to join him the next morning to the market where a large truck he rented was filled with tons of food and cleaning supplies that we delivered that afternoon to the entire village and a few other villages we encountered along the way.” Thanks to Nazareth and under the umbrella of the Monte Melkonian Fund, Inc., truckloads of desperately needed humanitarian relief made their way to thousands of people in the most remote villages of Artsakh, particularly those in war-torn Kashatagh, Karvachar, Martuni and Martakert regions (click here to see photos and video materials of his aid distribution). Many times Nazareth himself would accompany the distribution of aid but never revealed to the recipients that, in fact, it was he who had paid for the food and supplies. When asked, he would speak of an imaginary donor in the United States, who had supposedly entrusted him with the task of getting food to the people who needed it the most. At the same time, Nazareth Berberian was researching the possibility of establishing business enterprises in order to help the people to whom he was providing charitable aid become economically stable so they could provide for themselves. A number of these ventures he later implemented. The next turning point in his life was in 1998, when Nazareth Berberian moved to Armenia for permanent residence with his wife and children. He always referred to that major event as his lifetime dream come true. However, that did not imply sitting back and enjoying the gorgeous view of the twin snow caps of Mount Ararat, visible from the window of almost every Armenian home. In October of the same year, in the picturesque village of Dalar, located in the heart of Ararat valley, Nazareth established Bernar LLC, a rug manufacturing company. Owing largely to his previous experience in the same field, Bernar made a quick and efficient start. Besides producing Armenian, Caucasian, Persian and decorative rugs, the company pioneered the production of silk rugs in Armenia. Nazareth Berberian was among the active participants of the first Armenia-Diaspora conference, which took place in September 1999. He attended a session on economic development, which was chaired by Vartan Oskanian, then Armenia’s Foreign Minister. The information he imbibed from this major economic event bridging the gap between the Diaspora and Armenia helped him identify the existing issues and inspired him to find solutions to each. He was elated by the prospect of his personal contribution to the welfare of the fledgling republic. 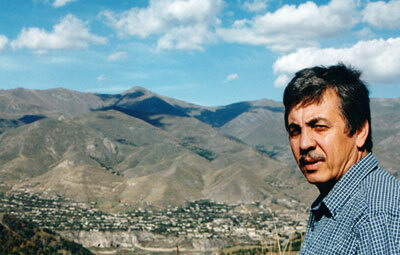 In 1999, Nazareth Berberian established Project Armenia, a non-profit organization in the U.S. The chief purpose of the organization was the implementation of educational, cultural and social programs to generate employment opportunities as top priority for Armenia. Owned by Project Armenia, Bernar LLC was a major part of Nazareth Berberian’s charitable initiative. The plant that employed great many a native was equipped with the latest technologies of rug and carpet production. Given the increase in demand for production, the management believed the enterprise had the potential of creating up to ten thousand jobs. Production was chiefly aimed at exports, and all proceeds flowed back to Project Armenia for more charitable initiatives. "Nazareth was a man of high and exquisite taste; for days he could be ransacking his brain over the right choice of colors," reminisces Areg Grigorian. "Sometimes after everybody had gone home, he would stay at the factory for hours, trying to solve the puzzle of the right color for a specific rug." To popularize Bernar rugs, Nazareth Berberian opened a showroom in the city of La Canada Flintridge, CA, in December 2007. He had plans to open showrooms in Yerevan, Armenia, Athens, Greece, Scottsdale, AZ, as well as Las Vegas, NV, in the years to come. Berberian's second business venture was the establishment of Lil Nar Construction Company, which was to help him construct a carpet showroom in Yerevan, Armenia. However, he later decided to incorporate that idea into a larger concept. 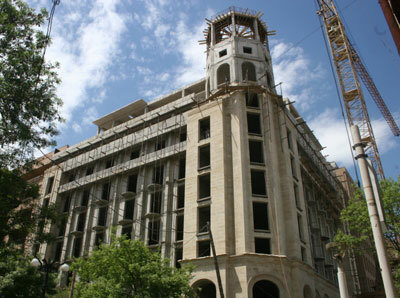 In 2006, Lil Nar undertook the implementation of his last major project of building a high class hotel by the name of Aragats in the heart of Yerevan at the intersection of Pushkin and Abovian Streets. Nazareth was planning to dedicate the first two floors of the hotel to a trading center that would showcase the best of Armenian productions, including high quality Bernar rugs. Intended to attract business travelers for accommodation, it was a brilliant marketing step for the exposure of Armenian exportable goods to potential international buyers. The original planned size of the hotel further grew at the request of the Yerevan Mayor’s office, with the offer of a 99-year land lease of a small plot of land behind the already owned property. For this, residents living in dilapidated dwellings on the offered land were relocated by eminent domain, which was implemented in the name of revitalization of the city’s center. Unlike many developers who paid the residents far below market value for their properties they acquired, effectively putting families on the streets with no place to go, Nazareth Berberian paid not only market value, but would find an excuse to pay an additional $10,000 to each family in order to make sure those who were relocated could purchase and furnish a much nicer place than the rundown buildings they had been accustomed to. Alas, the thread of his life turned out to be shorter than his long-term plans. Sometime between April 25 and May 15, 2009, Nazareth Berberian was brutally tortured and then murdered by barbarians to satisfy their greed and envy. Multiple philanthropic missions were left unaccomplished, and his family was left mourning over an irreparable loss. Nevertheless, a great philanthropist that he was, Nazareth Berberian will never be forgotten. No one should forget the deeds of a man who went beyond passive sympathy and did something to better battered lives. Nazareth Hagop Berberian is survived by his four children, Nyree, Jakob, Arpi, Mary, his wife Liliana Berberian, his sister Nouritza Berberian, and numerous relatives and friends. May God rest his soul. <h2 class="title">Another Suspect Arrested in Nazaret Berberian Murder Case</h2> [ 2009/09/22 | 11:41 ] important criminal RoA Police Department Kentron Division Chief Ashot Karapetyan reports that a little after midnight this morning Moscow police took Karen Dallakyan into custody in connection with the murder last spring of American-Armenian businessman Nazaret Hakob-Berberian. The suspect was about to board a plane leaving Moscow. Already arrested for the murder is his acquaintance Petros Demiryan. It appears that Dallakyan was a friend of the arrested and had no direct connection with the slain Berberian. The police report that Dallakyan, a barman by trade, was more deeply involved in the murder than Demiryan.Mr. Berberian had been drugged then suffocated. The perpetrators used his jeep to transport the body to a stretch of road along the Yerevan-Sevan highway, where they buried it in a rocky culvert. They then parked the jeep in the Zvartnots Airport parking lot to give the impression that Mr. Berberian had gone abroad. Thank you for this great story. I am sad that the end is so terrible. Minutes ago, a Yerevan court sentenced Gevorg Badalyan to life imprisonment for the murder of Nazaret Berberian in 2009. Badalyan is the third person to be sentenced in the murder. Mr. Berberian, an American-Armenian businessman, was found dead on a stretch of road 25 kilometers north or Yerevan. Traces of violence were found on his body. On April 28, 2010 a Yerevan court sentenced Petros Temiryan and Karen Dallakyan to life in prison for the murder. The businessman, 57, had gone missing after leaving his Yerevan apartment on April 25, 2009. Nazareth Berberian was murdered by strangling and injection of ketamine. The criminals transported his body to a ditch by the Yerevan-Sevan highway in the victim's car, which was afterwards taken to the Zvartnots Airport to create an impression that Berberian had left the country. The car was in a working condition, there was no sign of robbery; even the alarm was on. A native of Armenia, Berberian had moved from Yerevan to the United States with his family in early 1970s. He moved back in 1999 and engaged in a range of business activities there. His Lil-Nar company was also building a hotel in a prime location in central Yerevan. It stands uncompleted today. Berberian was also engaged in charity work both in Armenia and Artsakh.